IS SETTERFIELD WORTH THE HYPE? For two preseasons we have heard from the Giants, and then the Blues, how skilful Will Setterfield is. Sadly 2018 was ruined with a preseason ACL injury but that didn’t stop the Blues from swooping on the Giants’ list again, and amazingly the hype remains. So now we wait to be impressed. Given the state of the Blues’ midfield, which is clearly a soldier or two short, Setterfield should step straight into a midfield role as soon as he’s ready. With the devastating second knee reconstruction required by Sam Docherty, Setterfield could even run across half-back or a wing, but wherever he plays he’s a bargain at that price. Given he has only played 2 games in his entire career, it is difficult to predict anything to do with Setterfield, but surely he’ll average as much as any first year rookies. And now, for his sake, let’s hope the young fella can stay on the park. I coached Newman in 2017 and traded him out the week he pumped out 151 points and never recovered. Like Tom Mitchell before him, Newman seemed to be hated by Horse at Sydney and his game suffered accordingly. In 2017 he averaged 21 possessions, 5 marks, 4 tackles and 83 SC points and looked like he had a decent fantasy game. However after 12 scores of 80+ points in 2017 he could only manage 4 scores over 80 points in 2018. Was Newman stifled by Longmire at Sydney or is he just not that good a player? Now at the Blues, we are about to find out. If Neman can nudge his scores towards 90ppg he is worth a starting position, but he is awkwardly priced. Obviously we won’t know much until we see Newman’s role, but with Doc out for the season, he’s likely to spend plenty of time playing behind the ball with Simpson and Williamson. I see 85-90ppg in his future. Williamson missed 2018 with a back injury after a relatively successful first season in 2017. He was a running half-back with elite fitness in his junior career and should slot in well to the Blues’ backline and help replace Docherty. Even though last season was ruined with injury, Williamson now has two seasons in the system so he should be able to improve on his first season average. He is unlikely to score huge numbers as he has never been an accumulator but at his price he is a lock if he plays round 1. Just don’t expect more than 60-70ppg. NO RISK, NO REWARD! RIGHT? Kreuzer started as the highest priced ruckman in the season and his price fell off a cliff after a round 1 groin strain hindered him for weeks. He showed some flashes of brilliance with 3 tonnes in four weeks from round 8-11 but he just never got going for the season. Unfortunately for Kreuzer, this is not an isolated incident. Across his entire career he has only averaged 15 matches per season and at age 30 in May, time is against him. That said, if you are willing to take a risk, you could get a bit leg up on the competition if Kreuz gets off to a flying start. I get the impression that the Blues prefer playing a single ruckman. That may change after West Coast winning a premiership with tandem ruckmen, but if Kreuz is fit and solo rucking, expect a healthy 95-100ppg average. Great write up Thommo, Currently got Newman in but you’re right he’s very awkwardly priced. Might switch him to wait and see, he either relishes the role and can be selected round 3 or doesn’t do a lot and can look at a rookie that makes cash. Thanks Joestar. Yes, I’m worried Newman will be one of those ‘decent’ scorers that you get stuck with. Like Petracca last season. Setterfield is an absolute lock and should be one of the rookies of the season. Has a supercoach friendly role as evident in his only 2 games (averaged 5 tackles a game from limited TOG) and will have increased opportunities at the Blues. Will be interesting to see if Newman is one of the major beneficiaries from Docherty’s injury but I think there are safer picks around the same price range. Kreuzer is very enticing as he could be used as a stepping stone to a Gawn/Grundy and the 250,000+ difference would allow other lines to be strengthened but the injury risk is very prevalent. He had a career low 24.3% HTA rate with only 5 games exceeding 5 Hitouts to Advantage and he averaged 110 from those 5 with 2/5 below 100 and 2/5 120+. In comparison to 2017 where he only had 2 games below 5HTA and had a HTA rate of 28.4%. Will be steering well clear of Kreuzer; his supercoach career is over for mine. Have to agree with Adam re: Newman; too many better options at a similar price. Lachie Weller (GCS) who stormed home last year and will likely play pure-MID in 2019, is just one of those. Williamson will need to average 63+ to be a decent cash-generator. Not 100% convinced, but we may not have too many options down back. Will wait for injury updates and the JLT series before making that decision. Is he really? I nearly spat my beer all over my dinner! Allsainter, do you see Conner Blakely playing a somewhat similar role to Weller? He’s in SC defence but is he likely to play significant midfield minutes for Freo? I have him as a bit of a POD believing he’ll spend time in the middle. So do I. Nat Fyfe says he is penned in for a MID role in 2019. His 2017 numbers suggest that if he is, it’s a good call. Huttabito might be able to shed more informed light on this. All that said, it’s too early to know for sure. Apparently Cerra has put his hand up, returning to the track in ripper nick. He could be one of the very few who goes close to a ton in just their second season. Will be watching Brayshaw (FRE) too. Was just beginning to show what he’s capable of before a cruel blow ended his season early. At Newman’s awkward price i’d pass on him if he was a mid but as a def i can bear it. He’s at 394K so he’s ~120K under an elite defenders price. If he can pump out a 90 avg which is not too unrealistic then he can stay on for much of the season in a D6/D7 sort of position. Will be interesting to see if he gets first crack at Doc’s role, if he does then he’s gotta come into your SC calculations. 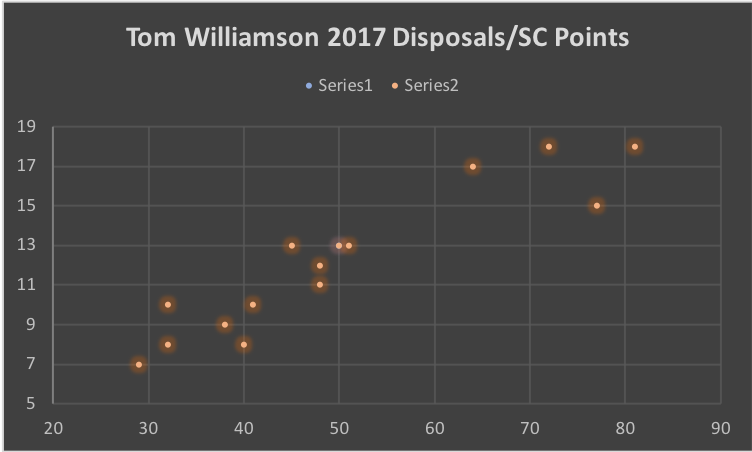 An interesting thing to note about Williamson is that in 2017 there was a .92 correlation between his disposal count and his SuperCoach score. He averaged 35 when he had under 11 disposals, and 74 when he had more than 13. If he picks up some of the running/distributing role vacated by Docherty, he could score very nicely indeed.